To add a shadow stretched out on the ground, simply add a Quadmap node to flip, stretch and skew the matte. Attach the entire effect to the same trajectory as your drawing layer and watch the shadow move along with your character—see Quadmap Node. 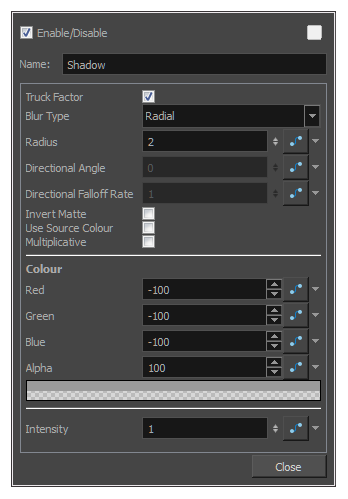 Display the Shadow properties and adjust the properties to control the type and amount of blur and the colour of the tone effect.